Apple recently added the ability for Xcode to automatically create instance variables for you. This means you no longer need to add an @synthesize for each property you create. But does it really do that always, or are there scenarios where no _ivar is needed? Are there situations wehre you do need an explicit synthesis? For example what about properties which are just passing through values to a sub-object? I wanted to know, so I experimented a bit. I even filed a Radar with Apple for clarification which came back with a good explanation. Let’s create a new class for our test. 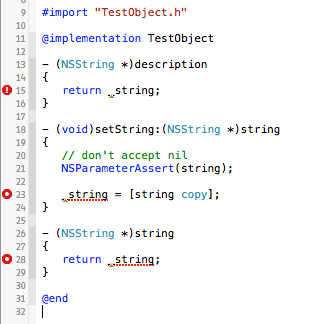 No compiler error so far, so _string indeed exists. The synthesize is inferred, Xcode simply assumes that we had written the following somewhere in the implementation (personally I prefer to have these at the bottom). This creates an instance variable that is also called string, which is inconvenient since that forced people to name they setter method parameters something like aString. Yuck! This is correct behavior. Once both the getter and setter are provided no implicit storage gets created. When you need an ivar, you will need to use @synthesize. If you have a readwrite property then you don’t get an implicit ivar if you overwrite both setter and getter. Does it make a difference if the property is change to readonly? Yes. For readonly properties you only have to override the getter method to prevent ivar synthesis. Since I was used to supporting older Xcode versions with my open source frameworks like DTCoreText I still had the habit of explicitly defining all instance variables as well as adding an @synthesize property = _ivar line for each of them. This is why I didn’t benefit from or understand implicit IVAR generation until now. Honest mistake. But working on apps that require more recent Xcode versions to build allows me to also save me some typing because I now know how implicit IVAR synthesis works. To summarize: For readwrite properties you get an _ivar if you don’t overwrite both the setter and getter. For readonly properties you only get an _ivar if you don’t overwrite the getter. You’ll also need to explicitly synthesize if you have a property in a protocol and then implement that protocol. Oh, and there is another twist. If you use atomic, you’ll have to write both accessors or synthesize both accessors. This is because the implementation used for making the property atomic must match or else they won’t be able to exclude each other. This is fascinating. I’m sure I had the oppostie problem a few days ago. I added an own getter and setter for a property and didn’t need the ivar at all. But the ivar was still generated and I had to add @dyanmic propertyName; to remove it! Good Educative post. Perhaps the era of mobile ad network will be fueled further as the mobile apps developers will get codes free. However, the ad network companies like appnext or chartboost will hardly slice down their ecpm.